In the SEO world, there’s a rule of thumb that as soon as one tactic works, everyone finds out about it and overuses it until it no longer works. This might be a cynical way to look at marketing. But I think that’s how outsiders see this industry. Those people ruining their online experience with pop up ads, and hollow content marketing. But. Maybe the people responsible for crappy marketing aren’t real marketers. After all, if they’re not stirring up positive conversation about a brand, then are their tactics really working? Are they real marketers? And I say real marketer like it’s a thing, because I think after hearing today’s guest, you’ll understand what I mean by this distinction. Rev Ciancio is a REAL. MARKETER. From his personal brand that’s focused on food culture, to his career helping local marketing agencies at Yext, Rev doesn’t follow processes. Rather, he works in ways that come naturally to him, which just so happen to also be great marketing tactics. And I think the difference here, is something that Rev talks about here – it’s about being human. To be honest, Rev is one of the most human marketers I’ve met. His brand is just… him, a guy who’s just really good at talking to people about what he loves. 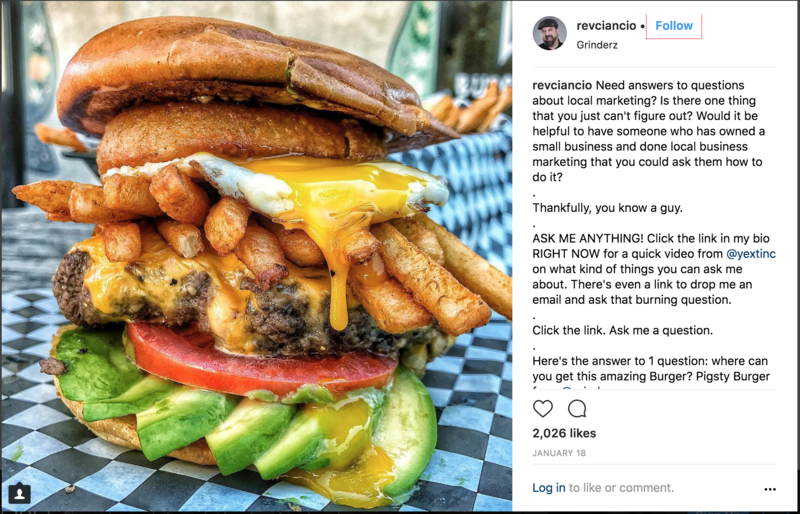 In today’s episode, Rev and I will talk about how he built a following of small businesspeople on Instagram of all places, and how that journey, which started with hamburger photos, took him to Yext. We’ll also hear about his local nonprofit, and why he likes being a small fish in the big pond that is New York City. Rev, welcome to the Zip Podcast. So, you seem like the kind of guy with a lot of projects going on from your position as Director of Partner Marketing with Yext to your 2016 Certified Angus Beef Marketer of the Year Award and also the local non-profit fundraiser you helped run in New York. But one common thread in a lot of this work is that you love marketing and you seem to love good food. So, how did you get into both of these areas and how did you get two of your biggest passions to work together? Man, I love interviews that go right into the meat of it. Megan, thanks for having me on the podcast. I’m super excited to be here. How did I get into food and marketing? Food to me has just been one of those, I know we eat three times a day and that’s energy for your body or whatever. But food has been this central theme of my life. I would get a good grade in high school, my mom would take me out to eat, celebrate with a burger. My dad would get a promotion at work and we’d go out for steak and there’s just been this central theme of food in my life where it has emotional meaning. Not just fuel for the body. So, I’ve always been passionate about how food brings people together. And where the marketing thing came in, I actually don’t know where the genesis of my passion for marketing came from other than, I like to share things with people. And I think at the end of the day, that’s kind of really what marketing at its core is about. Hey, I know about this thing. You should know about this thing. And food and marketing to me was always just like, oh hey, do you know about this pizza place? You should check it out, it’s pretty awesome. And then a friend would react, I’d get a phone call. That pizza place was great. And then suddenly I’d realize that I had influence. Then I also had the ability to help a business. And so, what happened over time was that ability to recommend something or that ability to recognize greatness in a product or service, then recommend it and have it connect with another person was innate with the professional side of my life as it grew. And somewhere down the middle I was like, oh marketing and food. Yeah, I want to do that. Two things that just make me happy. Yeah, and I always feel like the best marketing is the highly, most genuine marketing. You know what I mean? 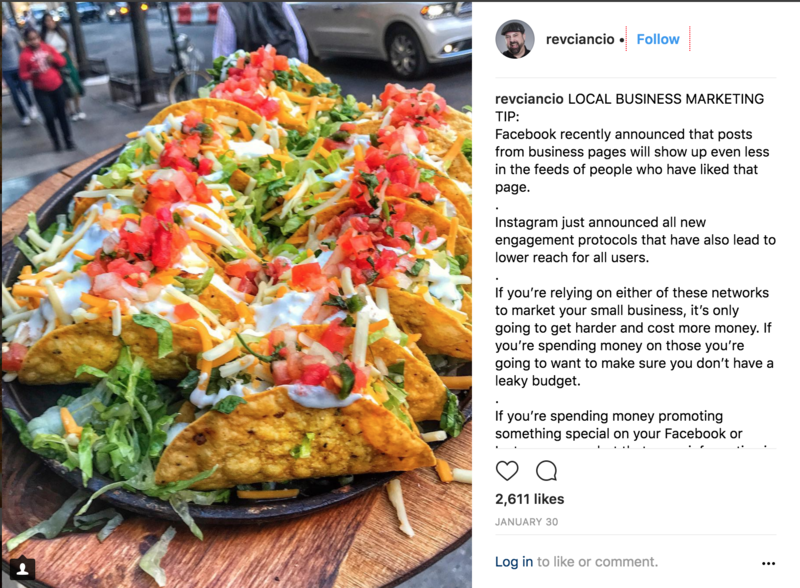 It’s like, you really liked that pizza place so when you recommended it to your friend it’s like, you were kind of marketing it, but you probably didn’t think of it as marketing. You were just like hey, I want you to have a good experience that I had. So, in a way I think it’s really cool if you can marry marketing with something that you truly are passionate about. Because then the marketing part is kind of easy. Totally. I mean, do you remember a pizza place growing up or in high school, college that affected you in that way? I do. Actually, I live near my college town now and I’m going to meet a friend for dinner later. I have a pizza place and a burrito place in mind, and I really hope we go to either one of those because, yeah. You remember these places and you come back years later and you’re like, I just want to go. It’s so good. You want everyone to experience it. So, yeah. I know what exactly you’re talking about. I went to UNC Chapel Hill. Okay. I had a barbecue place there once, but I don’t remember the name. Oh, is it the one where there’s a pig on top? You know what, I’ve never been to that place and it’s so recognizable because there’s a plastic pig. I should probably emphasize for those listening that haven’t been there. It’s a plastic pig. But yeah, on top of the restaurant. I should check it out. It’s actually right near the burrito place that I love, so I think if I’m in that area I’m just like, ah got to go to Carrburritos. I remember in college, there was a pizza place. It was like $5.99 for two medium pizzas with four toppings each. Which, in college was like, by today’s standards, that’s still ridiculous but even then, it was ridiculous. But what we found out is that it was free delivery. So, we would go party in the neighborhoods on Friday night and then not want to walk all the way home back into campus. So, we would call and order a pizza and then walk into the pizza place like yeah, can you deliver me with a pizza? And so, we would get a free ride home. They did. Well, they couldn’t argue with our rationale. Well, I paid for a free delivery. Can I get a ride, too? We always tipped the driver like three bucks. So, I guess maybe we invented Uber Eats. That’s like a weird version of Uber Eats, yeah. Yeah, a very early version of Uber. That’s really funny. Do you think eventually they kind of caught on and maybe they could be like, there’s an extra fee if you’re actually going to be in the car with your pizza? I think there might be an insurance issue there. But that’s where marketing went from disruption or differentiations and attributes. There’s always those smart college kids that just find a way. Where did you go to school? Very cool, yeah. I know some people that went there, too. Awesome. So, you went to Michigan State. You’ve always loved food. And then I think you went back to New York, right? And you found an agency focused on marketing food companies. So, what’s the story there? So, I moved here from Michigan in 1996 and I actually started working at an agency that primarily focused in the music business. And after about a year and a half, the agency shut down and me and the five people that were sort of running the actual business there, started another agency that was just like it. And the music business and I ran that for 11 years. And one day, I just sort of got frustrated with the music business and I didn’t want to do it, and I started another agency. And that agency was sort of in the music business but sort of in the brand building business. And at that time, I had started a food blog. Actually, I had started a couple food blogs. And the food blogs really started to catch off. When that was at a time, like 2003, 2004 when social media was really becoming a word people were using and a platform that people were excited about. We were going from MySpace to Twitter and Facebook. And at the time, I was using them to promote the bands I worked with because the music business is really the first industry that sort of, embraced social media. You remember Justin Timberlake bought MySpace? And so, I was like, oh I could use these to promote my hamburger blog or my hot wing blog. And so, I was getting all this traction about hamburgers while I was helping bands market their new single. And restaurants in the New York area started calling me and saying, hey this is really interesting. Do you think you could leverage that for my business? And so, I started organically getting these clients that were hamburger restaurants, and barbecue shops, and places. And I just looked at it as another… To me it wasn’t different than the music business. I still developed a client base, and loyalty, and return trips, or by the next CD type thing. It just became a new form of marketing and eventually as downloads became prevalent, and the music business sort of started to crumble, I realized something really important about the difference between hospitality and music. Is that, if you like a band, you might buy their favorite record once but you can’t download a hamburger. If you really like that hamburger, you’ll probably go eat it again. You know what I mean? And so, that sort of – I’m not doing music anymore. I want to go do food. I want to go do hospitality. And I opened up a bar, and that was kind of like the death knell for music for me. As you were giving your answer, I was thinking about the difference between marketing for food and marketing for music. Yeah, I guess one of the biggest differences would be – and it’s kind of unfortunate. Obviously, people who make music, work incredibly hard. Probably just as hard as people who make food. But there is… Yeah, anytime you have – even if you have the same hamburger over and over again, you expect to pay for it every single time. Whereas with music, you buy a song once and then you feel like it’s yours somehow. I hadn’t thought about that. Yeah, even your favorite band tours once every two years, three years, whatever. You may or may not shell out money based on your availability. But I ate three or four meals a day. I’ve had way more tacos than I’ve ever listened to Metallica songs. Yeah, I can see how that… Marketing is just a different world. And I think, so one of the other things you told me, I think via email was that for you, Instagram is a huge source of leads. And it’s funny because I think – I also agree that Instagram is a really great marketing channel right now because I think visuals are just so great at captioning our attention. But when I’m on Instagram, I see a lot of ads for jewelry and clothing companies. More like national brands and it might just be my demographic. Oh, we know she likes jewelry. But I don’t get a ton of Instagram ads for restaurants in my area. Do you see a lot of that where you are, and do you try to incorporate a lot of that, and how have you gotten that to work for your clients? So, let’s unpack a few things there. First of all, I don’t really run the agency there. I sort of, gave that up to come work here at Yext. But my role here is to provide marketing support to agencies. Who use Yext for their customers. So, I still can answer the question. I’m just not doing it with my clients. I’m helping other agencies do it for their clients. So, I can sort of give you answers on both sides of the coin here. In terms of what you’re going to see on Instagram – it’s based on a larger algorithm that looks at the activity that you’re doing on either Facebook or Instagram because they’re tied. So, if you are following a bunch of fashion accounts, or jewelry accounts, or whatever, retail accounts, you’re going to get more of that content. 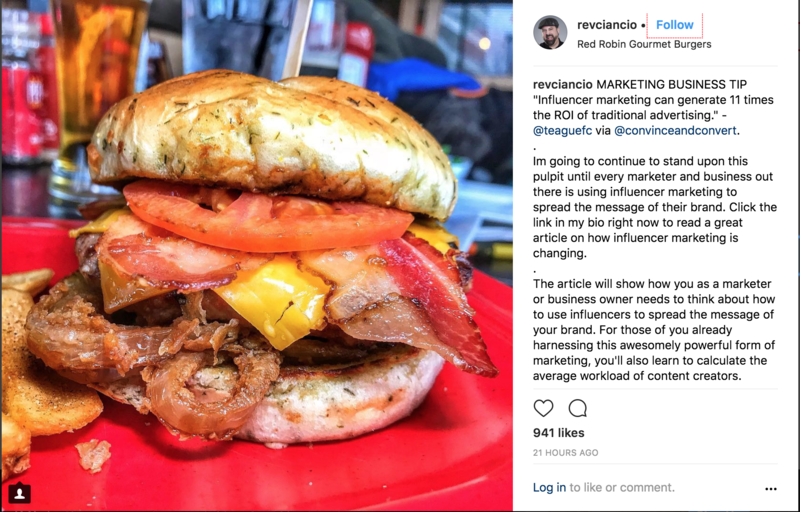 And if you are liking content, whether it’s from your friends or those brands, or whoever, that’s relative to that content… Then Instagram’s going to give you more of it. And so, as you can probably imagine since I mostly post pictures of pizza and hamburgers, all the sponsored posts I get are from restaurants and food brands. Occasionally a music one will pop up or some other thing that I’m sort of, tangentially interested in. But that’s just sort of how the algorithm works. So, what was the other part of that question? Oh, generating leads. So, when I was actively running the agency, I had built up a following on my food blog, burgerconquest.com which I actually still write. And now it’s just hospitality and marketing tips. I built up an audience on LinkedIn, Facebook, and all these social platforms. But where I had the largest audience was Instagram. And I was looking at what other people in my space were putting on Instagram. And so typically – and probably everybody that’s listening to this has seen it. Here’s a picture of food, and a description of food, and the restaurant where you can get it, and oh my, God it was so yummy. They’re all the same. We all have the same iPhone, we all have the same filter, device. Burger is a burger, is a burger on Instagram. And I was like, well what can I do that’s different? And I didn’t want to add a prop. I didn’t want to have a toy. I didn’t want to throw my food in the air. I was like, what can I do? So, what I started doing is instead of using that space to describe the attributes of the sandwich ID, I used it as a platform to write hospitality and marketing tips. And I still do it. I put one up this morning. And so, rather than saying hey, this burger was delicious, I’d be like by the way, do you know that if you don’t manage your Google, My Business profile, you can be missing out on 67% on local search? Here’s how to fix that problem. And then I’d give a quick tip and I would say, click the link in bio to learn more. And then that would lead to a blog post about Google My Business for restaurants. And then I’d have a, hey here’s how to do this yourself. And at the end would be an email. Hey, want help? Drop me an email. And if I got somebody to go all the way to the bottom of that blog post and click on that email, and reach out to ask me a question, I had something like a 92% close rate as an agency. I understood who my client base was and I understood the value of what I was offering. Which at that time, was sort of, I’ll do the rest for you, listings, management, digital knowledge, management type platform. That if I could explain the value and importance of doing that as a business in a way that a small business owner, particularly hospitality, understood it… But then make it seem like there was no way to have time in their day to do it, and then they emailed me… I didn’t have to do anything else but butter the toast. That was me understanding, okay what’s my value prop? What is it I can do for somebody? How do they think… How can I speak to them in a language they’ll understand? How do I explain to them a problem they might not know they even have? How can I make them want to solve that problem and how can I make them want to have me do it for them instead of doing what they’re already doing? So, when I understood that ecosystem, I was able to leverage Instagram into a lead generator. And so, most people look at Instagram and go, oh well how many likes did that post get? Or how many followers do you have? Or how many comments? I actually don’t care. I never cared. Sure, I want more and higher engagement is better. But I only care about the person that finds that post, reads the marketing tip I put forward, and then clicks the link to my bio. Clicks the link in my bio to my website. Once they’ve done that, now I really care about them. But I created a self-selection process. If they did step one, two, three, and four, they basically have qualified that they’re the right person for me to talk to. And so, most people I don’t think look at Instagram that way. I think they might look at Facebook ads that way or they might look at inbound marketing, their content on their website or PPC ads, or even LinkedIn. And I just doing think people look at Instagram that way. But what you said earlier, food is pretty visual. If you’re marketing software, it’s hard to put a picture of software on your Instagram. You have to think around the software and think outside the platform. Yeah. No, that’s so smart. I have so many thoughts coming up in that. But I think what you did is because you knew exactly who that audience was, you were able to kind of speak directly to them and be like, your turnaround rate, the number of people who ended up from clicking that was so high, that ended up using you. You didn’t need that many people who went through that process. It was just the few select people who do. And that’s really cool. I also, I like how – because you were talking about how you transitioned from working with musicians to working with food. And I think one big transition that happens there is that you’re going from working with people who, especially if they’re a very popular music artist, they’re kind of everywhere. Whereas, food is inherently local. So, did you feel like you had to learn in that transition process, how to speak to people in this new language? Where it’s like, they don’t care about people in Phoenix if they’re in New York. All they care about – they don’t even care about if you’re in downtown Manhattan, you don’t necessarily care about customers in uptown Manhattan. You care about people within a very, very small radius. And did you feel like that transition was something you had to adapt to when you moved into food? That is an excellent question and I think that the most experienced and most highly regarded experts in the space, do know how to do that. But I don’t necessarily know that you have to get that granular into it. I think it’s more about personalization and maybe more about speaking one-to-one. So, let me give you an example. So, if I write an Instagram post about why you should manage all your Yelp reviews, as an example, and how to do it. I don’t write, hey everybody, or I don’t write to a one to all. I’m not writing to an audience. I know that the person on the other side of my Instagram account has two eyeballs and one face, right? So, I write it as though I’m writing one-to-one and I try to make the content as digestible as if I’m talking to you directly. And so, while the nuance of uptown versus downtown is definitely important and being the highly tuned engine of being an expert. Yeah, that’s some boss level stuff. I would tell people to start at like, don’t write one to many unless the message deserves that. Write from one-to-one, and from an agency space, too. I see a lot of agency blogs, or agency email blogs, or even software companies where the emails are written from the brand or the blog is from the brands. And we all know a human wrote it, so let the human own it. If I happen to really like Jess, who runs our social here at Yext and she’s a pretty prolific writer… If I happen to like what she has to say about digital knowledge management, the importance of being ready for voice search, I’m going to go follow her. Or Duane Forrester who works here, who’s a really smart guy. He used to work inside the search engine at Bing. He knows how search works. I want to know more from Dwayne. I would rather follow his content because he wrote it, than if Yext wrote it. Not to speak badly of my employer, but we don’t necessarily do that here. But what I’m saying is, if you run an agency or you’re at a brand, you can personalize things. There are times at which it makes sense to put that content out there with a name attached to it. Assign thought leadership to the people that are providing it and that humanizes the brand. So, back to your original question. Yeah, I do think that’s important, but I think there’s a step before that. It’s about humanizing a product, humanizing a brand, or showing the hands that created something. You know what I mean? Yeah, exactly and I totally agree. Even with team pages on websites, sometimes if exploring a different product, or service, or agency, I love it when they put their whole team out there. And then on the blog they say, this is by this person. That is by that person. As opposed to, every blog post is just written by the company and you’re like well… It does feel a little less personal. So, yeah. On the topic of Yext, obviously, as many listeners probably know, it’s a service that helps brands ensure their online listings such as, name, address, phone number, store hours, etc., are posted and consistent across the web. So, you said that you work… help agencies better use Yext for their clients. Can you unpack that a little bit and explain how you went from the hospitality service agency to working inside of Yext? Sure. So basically, I used to work for a ground beef manufacturer. People that made hamburger meat. And one of my roles there was to provide their customers, which were primarily restaurants, with add on marketing services. So, if they needed help with social media, or paper click, or email blasts, or events, they could call me and then I sort of acted as a mini agency that would help them. And one of the things that I was saying over and over to all these restaurants was, how are you managing your information on sites like Yelp, Bing, Google, and Yahoo? And they didn’t really have an answer or they would say, I manually update it. I login to Facebook, I change my hours of operation, and I login to Yelp. I was like, God there’s got to be a better way. I know how important that is for search. I know how important that is for customer service. Then I sort of, stepped into Yext. I had a podcast like yours and we had Christian Ward from Yext come on the show, and he basically sort of explained the search ecosystem and the importance of managing your information. I was like, oh my, God this is amazing. When I owned a bar, if I had access to this software, it would have saved me so many hours and so many headaches. I was angry that it didn’t exist. And so, I started recommending it to the customers that come in. Hey, you should call this company, you need this. Here’s what you could do with it. And I eventually was like, I want to go own an agency where I do Yext for people. Because it’s a… local search is complex, and listings, data, management is complex. And reading review management, reputation management 2.0 is really complex. All these things are really, really complex and the internet changes every five minutes. Maybe faster. And there’s no way that if you’re a small business operator, that you have somebody in your organization who has the time to work at the speed of Google updates. You’re running your business. You’re a lawyer, you’re a chef, whatever, you’re a contractor. You’re doing business things. You have to hire an agency. Then I was looking at agencies and there weren’t a lot of agencies that were offering this. There were still these black hat SEO services and people were like, oh we can get you to the first page of Google, guaranteed. By the way, nobody can guarantee that. I was like, this is all BS. Why are people doing this? So, I created this agency where I was like, look. I’ll essentially do Yext for you. Nobody knew what Yext was. The listings management to a certain degree, still something most people don’t understand. And so, I was like, I’m going to talk on this subject on a level that the local business owner who has five minutes to think about the marketing of his business today can understand. And that was the business I started. I started with no leads, no customers, no content. Literally nothing. I had a laptop, a pen, a glass of water, and a desk. And within 90 days I was billing about $22,000 a month because I was out there just being honest and talking to people. Now granted, I had this audience I had built through social media or whatever. But I was just explaining to people. Here’s why you should reply to every Yelp review. Here’s what happens if somebody changes your Google My Business profile. Here’s why you should – here’s why Four Square’s important to your business. And people would read it and go, oh my god this guy can help me. And so what happened is, I got super successful super quick and somebody from Yext came to me and said, look, we don’t typically see this in the small agency space. We might see this at the largest strategic agency space but not in this space. Would you be interested coming here and helping our partners to grow their business, and working with small businesses? I’m very passionate about Yext and I’m very passionate about marketing, and I said yes. And so, I came here and I guess that’s a really long-winded way of saying, I went through this. I was a small business. I supported small businesses through a manufacturer. I started an agency that helps small businesses. So, I’ve sat on every side of the table. My job here now is to help people that are helping small businesses. If there’s a small business out there that’s smart enough to know I can’t handle these things, I’m going to hire an agency… It’s my job to help that agency be successful in using Yext, to help their customers achieve their business goals. Does that make sense? That does make sense. And that’s awesome, and it’s something I think about all the time. Especially when talking with so many local marketers about all of the nuances that are involved with Google Algorithms, with Google My Business. It’s like, every week it seems like there’s some change, there’s something to keep track of. And this is just… For them, this is just like one small part for the local bar owner or restaurant owner. It’s one drop in the bucket of all the things that they have to worry about. So, yeah. That’s really awesome and it must be really cool for you to be able to see the full picture and to be able to talk to not only the agency clients, but even to their clients, the small businesses. And be like, yeah I’ve been in your shoes, I’ve done that before. Yeah. I’m a nerd that way [laughs]. But I think that builds a rapport for them. Oh, this guy knows what he’s talking about. He’s not just a suit. You’ve kind of done it all. Yeah, I actually still maintain – I have one agency customer. They let me keep one. And when I came to Yext I said, look. I still want to do this for my one customer. I want to be the best at it. And when somebody calls me and asks for help, I want to know… Because I’ve known what it’s like to be a small business owner. I’ve known what it’s like to be an agency. When somebody calls me for help, I want them to know that I do this. I still do this on a daily basis and I know what you’re going through, I’m going to help you. And so, that’s sort of my role here. Its recently changed a little bit. Small businesses can also come to us directly and we encourage that. It’s a great solution for a small business. Somebody who wants to just do this stuff quickly and go back to what they were doing. It’s a wonderful solution. The agency solution’s a little more powerful, but I’m now overseeing some of the success in some of our small business channels. Small businesses can also come to me and ask for advice, and help, and I’m writing content for them. Yeah, that’s awesome. And so, not only have you done all of this work but you’ve also you do work that benefits the non profit space as well. So, in that way I think you might be one of the most fitting guests we’ve had on this podcast since we talk about local and non profits. Can you talk a little bit about the passports and where they came from? Sure, sure. That’s something I’m very passionate about. So, the good passports… The way it works is, a customer pays $37 and they get a card. You put it in your wallet or put it in your iPhone case. And for $37, you get between 20 and 40 drinks at 20 or 40 different locations at New York City. Now, we’ve done a few other towns but this is sort of our hometown. The idea is, you have 60 days to go collect all these cool cocktails and drink all these great craft beers, at all these cool locations. And we sort of vet the locations. We want a particular type of bar. If we’re doing a craft beer passport, we make sure the place is very craft beer friendly. They don’t just have a larger craft brand as a side tap. Or we’re doing the good whiskey passport, which is alive right now. It’s a place that really has a large whiskey library, and it has somebody on staff that can educate you about whiskey. So, it’s not just about getting cheap drinks. In fact, that’s probably the last reason people buy it. People buy it because they want to discover new places to check out in their neighborhood, or maybe where they work, or they want to explore new cocktails and new drinks. And so, this just sort of gives them a guide book. Now, the charity element of that. So, when we started to give passports about nine years ago, I started to think like, how are we going to market this? And I didn’t have a ton of money. I mean, I still don’t have a ton of money [laughs]. But it was at a time where we didn’t have Facebook ads and there was no Yext. I didn’t have an email subscriber base. So, I thought well, you know what I’m going to do? I’m just going to do good. I’m going to give back and hopefully that will spread the word of this. And so, with each of the passports we’ve chosen, it’s a charity partner. And so, a decent portion of the revenue generated by the sale of the passport goes to a local charity. And when we’re giving to a charity, we give it to them from passport one. If I sell 200 passports or 400 passports, they get a commission on every single one, regardless of operating costs. So, if it costs us X amount of money to put these things on, we don’t include that in what we give to the passports. So, if we actually lose money as an organization, we’ll still make sure that money goes to the charity. And so, the last element of the charity aspect of it is, we try to choose charities that are not only local to the GO where we’re doing the passport, like here in New York City. But we try to choose charities that are somehow giving back to people who don’t have the luxury of choosing where to get a drink that night. Or don’t have the luxury of knowing where their next meal is coming from. We sort of looked at this passport thing as, I have the ability to choose to go have whiskey tonight. I have the ability to choose where I’m getting that whiskey. And that’s a pretty cool thing I have access to as a human. But then there are people that don’t even know where their next meal is coming from. So, we sort of use this privilege that we have to go make these choices, to help others who don’t have that choice. That’s awesome. And such a cool… It all fits together so well. So, when you started this, how do you think if you hadn’t gone with the non profit route, if you hadn’t incorporated that, how did you think that would have been different? Or how do you think working with the non profits affected how the good passport program panned out? Oh, that’s a question I’ve never been asked. So, there’s a… When we started this… Actually make the story. So, I used to own a bar. We were in the east village. We were in a basement with no windows. In the winter, it didn’t matter. We were packed. People loved the place. In the summer, nobody wants to be in a basement bar in the east village with no windows. Literally, nobody. And the first year we operated that business, we took a 45, 50% hit over the summer months and we just couldn’t weather that storm. We just couldn’t make enough money in the winter to hold us through the summer and we were going to lose the business. So, I was like okay, put on the marketing hat, put on the local marketing guy hat. How do we stay open in the summer? And so, I called a couple of other bars that had sort of similar things that we were doing. We were doing craft beer, whiskey, and rock and roll. And I called some other friends that owned some of the bars and they were also taking a hit. Granted, it wasn’t as big as ours but basically, there’s less business in the city. People are in the Hampton, people are down the shore, people are on vacation, whatever. And so, I said to all those other bar owners. I said, there’s got to be a way that we can attract the customers that are here. And I came up with this concept where oh, I’ll promote to my customers to go to your bar if they’re not coming to my bar. And you promote to your customers to go to this other guy’s bar if they’re not going to go to your bar. And we’ll create like, you know how they used to have those things on the internet? Oh, you’re joining this site? Click here for more on this network. It was kind of that. It was kind of that but for craft beer. And we did it that first summer and I think we sold 300 of them. And every single bar that participated saw a lift in business. Every single bar that was on it. Even though they were giving away these free drinks, they had more business that summer than prior summers. It was like, oh we solved the problem. We did it again the next summer, this think worked, it grew, and it got bigger and bigger. Now, I don’t own that bar anymore but I still own the program. And so, it became a way to basically localize an army of people who appreciated a particular type of bar. So, the question was, how does the charity thing factor into that? So, when I was first calling those other bars, it was bar owner to bar owner. Hey, let’s work together. It was coming from an honest place. And so, the bar owners wanted to be involved because I was on the same playing field as them. I had the same goal. Well, I don’t own a bar anymore. And when I call them now, even this is developed, there’s two people that work on the team. We do it four times a year, it’s a much bigger thing than just me trying to get people to come to my basement in the summer. The charity thing has really kept it honest. And so, when I call a bar owner and I don’t own a bar anymore and I go look, we created this thing to drive more business several times a year, or to help you attract customers from similar businesses like yours… I can’t say, well I still own a bar, I know this works. But I can say, but we give a bunch of the money to this type of charity and the charity thing is really important to us, and we market it. You talk about that charity and I think that it develops trust from the bars, to sign up and give this thing a whirl. And we’ve been doing it for nine years. We have a number of bars that have done, nearly every single passport. There are bars that will be on for three straight years. And they’ve learned what the benefit of it is, to them in terms of a customer base. But the charity aspect is like, hey this is something you can really get behind. We do have this privilege of owning bars, and going to taste craft beers, and make cool cocktails. If we’re going to give back, let’s give back to people who can’t do that. And so, I think in terms of the business model, we’ve opened up marketing budgets since but I don’t know that if we hadn’t had the charity aspect, everyone would feel as good about doing it. Yeah, that makes a lot of sense because I feel like it makes… Like you said, it kind of brings it together in this way that there’s a purpose for it even bigger. And I love how – even just like you said, that first summer. You guys all managed to make more money just by helping each other out. It’s a really optimistic story. By giving what could seem like you’re giving away your business, you’re actually earning more business, which is awesome. Plus… So, the bars that participate, I will also help them with marketing. Oh, there you go. Free marketing as well. So, at the end we’ll send a customer survey. Did you enjoy participating in a good passport? Would you recommend to another bar owner, that type of thing. One other question is, what are you having with in your marketing? And one of them is, managing Google, listings on Google. A lot of those bars that I work with have become customers of Yext just as a result. So, one key thing that I’ve realized kind of in talking to you, is that even when you were a bar owner, you had this cool advantage of, you have this marketing mindset. And I feel like a lot of people who own local businesses, may have come from a lot of different backgrounds, may have a lot of different mindsets, and not everyone has that intrinsic, natural marketer in their brain. So, is there something – if you could give some sort of advice, or some sort of gift, or something to everyone who is a local business, what do you think a lot of people are missing in terms of marketing themselves? Oh my, God. I think that… God, such a good question. What’s missing? There’s probably a thousand things. Two things. From a very tactical perspective, all businesses on the planet should be managing their digital knowledge. If you do not have control of your name, address, phone number, specializations, biographies, photos, menus, on all the sites where people that search those things, you’re missing out on business. I guarantee it. And that universe is going to get more and more complex. It’s going to get harder, and harder, and harder. And what that means is, in the small business world, if I search best sandwich with meat, I’m already down the sales funnel. I’ve already decided that I need this. You don’t have to convince me that I need a sandwich. You just have to be there the moment of intent. So, if I search best sandwich near me and your restaurant doesn’t come up, guess what? You’re not getting me and I’m ready to buy. So, two answers. Number one. What’s missing is, businesses need to manage their data or more like, agencies need to bring this in as a service that they offer to the customers they work with. But number two, be a human. Be a human, talk like a human, market like a human. Your customers are human and so, when you’re marketing your business whether it’s on Yelp, or Facebook, or inside the business itself, just be a human. Talk to people like you’re a person. You don’t have to… Not everything is marketing speed. If I could erase one word from marketing, you know what it would be? Yes. It makes me so angry. Let me ask you. Megan, when was the last time you walked into the universe and used the word BOGO? Never. Maybe ironically, but I don’t even remember. Don’t use this word. And so, when I see a restaurant promoting sales. Hey, BOGO sandwiches… By the way, LOL. Nobody uses BOGO. I hate that. It’s not human, it’s marketing speak. It’s robotic. It’s being taught by a machine how to do something a certain way and it’s wrong. Just say, are you into prosciutto sandwiches? Ours is made fresh every day and we get the meat from this, blah, blah, blah. Come in on Wednesdays. Get one and your friend gets one too. Are you going to click the BOGO prosciutto sandwich ad or are you going to go, dude let me take my friend to lunch at this place that has this awesome sandwich. Be a human. Yeah, I love that. That’s a good tagline. So, finally. I love to ask each guest – since this is a podcast about local – I love to ask each guest a bit about the place where they are local. I know you said you’re from Michigan, you’ve lived in New York for a while. For you, what is it like to be a New York local? Why have you stayed for so many years? And yeah, what do you like about being a local there? You just nail these questions, Megan. These are great. When I grew up in Michigan, I got to a point where in my college town, I felt like I was the mayor. I could walk into any business, I could walk into any club or bar. Somebody knew me and I couldn’t go anywhere without being known. I was like, oh I’m done with this, I beat it. And that sort of happened a little bit in Detroit as well. Where I was going to these music venues and I kind of knew everybody. I felt like I’d exhausted the town and its social resources. I was like, I need to go somewhere where that will never happen. And it was either at the time when I wanted to be in the music business, Los Angeles or New York. And there was no way I was going to Los Angeles. I like reality too much. And so, I came to New York City and I’ve been here since 1996 and I still don’t feel like the mayor. And I don’t even know that our mayor feels like the mayor. And so, what is it like to be a local in New York City? It’s endless opportunity. It never ends. It doesn’t matter whether you want to be a bank teller or you want to own a software company, or you want to be the best Yelper out there. There’s so much competition, there’s so much opportunity, there’s so many things you can do. There’s so many places to go. And surviving in this town isn’t easy, but the ones that do, there’s just so much reward to it. And being a local here is like living in the greatest opportunity that there is. Now look, it’s expensive, and it’s difficult but that’s… If it was easy, everyone would do it. And I think because New York City has such high competition and there’s so much opportunity here, being a local here is great because if you don’t like this one thing, you can turn the corner and there’s another option. And so, I still eat at McDonald’s. I ate at McDonald’s yesterday morning. But there are days when I don’t want McDonald’s. Like tonight, I’m going to go to San Mateo Pizzeria. It is one of the top 3 pizza places I have ever been to in New York City. I’ve only known about it for three months. I will go there as many times as I can because it’s amazing. But if Fabio who owns the place, decides he wants to pick up and go back to Salerno and close the spot, there’s ten other pizza joints that will step up to be my favorite. That’s what it’s like to be a local here. That’s awesome. I want to put that on a t-shirt or a mug or something. Just the whole speech somehow. That is a very good response. Well, Rev. Thank you so much for sharing your brain, your love of New York, your love of food, and your love of marketing on this podcast. And yeah. Is there anything that I didn’t ask you about that you’d love to mention before we sign off? I love my wife, I love my kid, I love being a dad. And if anybody needs my help, you can reach out to me. I’m Rev@Yext.com. Drop me an email. I’m happy to answer questions, or help, or whatever. And follow me on Instagram. It’s just my name @revciancio. If you’re into extreme gratuity in pizza, hamburgers, French fries, that’s exactly what you’ll find there. Awesome. I will check that out as well. All right, well thank you so much for being on the Zip today. Thank you, Megan. I really, really appreciate it. Best of luck.